In a weekend workshop I gave in Kennebunkport, Maine, I taught more than 120 "advanced" psychics and mediums the simple steps necessary to raise their standards to a higher level. And I taught them how to give readings that are absolutely extraordinary. At the same time, since no psychic or medium can help people unless the public knows they exist, I also taught them how to promote themselves using the most effective yet simple techniques available in order to attract more clients and prosperity into their lives. This training workshop was an enormous success. All the psychics and mediums walked away from it as better psychic mediums and better marketers, which is why I'm so glad that I had it professionally recorded. Now, thanks to these recordings, anyone can listen to this workshop right on their computer or MP3 player. In fact, this recording is available now as an instant MP3 download, so you can be listening to it just minutes from now. Hundreds of psychics and mediums already have. This workshop was given to "advanced" psychic mediums, so even the most experienced psychics and mediums will learn a ton of new information from it. But you don't have to be an advanced psychic or medium to benefit. It turned out that some beginners signed up for the event without my knowing, yet they later told me that they gained a life-changing amount of information from what I taught them. They also said that they began implementing what they learned the very same week they returned from the workshop with amazing success. So, whether you’re highly experienced or just beginning, if you know how to give a reading but you have room for improvement (and everyone does), this program will teach you how to transform your readings to levels you might never have believed were possible. Having said that, this is not a workshop that teaches complete novices how to develop psychic or mediumistic abilities from scratch. You should already be giving readings, if even on a part-time basis for free. As long as you know how to give a reading, this audio program will teach you how to take your current readings to a new, higher level, from poor readings, mediocre readings or even good readings to absolutely extraordinary readings. But that's not all you'll learn. I also teach you how to attract more clients. Learn to turn your part-time or even struggling practice into a successful calling (profession) that brings you greater fulfillment and security, as well as increased prosperity. Because of the vast amount of business and marketing advice that I teach, this workshop literally pays for itself because it teaches you how to turn your psychic or medium practice into a lucrative and successful calling in only a few simple steps. Many workshop attendees later told me that they earned back the workshop fee and all their travel expenses within two or three weeks using what I taught them—all while giving their clients greater benefit and satisfaction, too. I’m the author of Answers About The Afterlife and The Magic Mala. I'm the host of AfterlifeTV.com. And I'm the founder of BestPsychicDirectory.com and BestPsychicMediums.com. As a former skeptic and private investigator who began investigating psychic mediums and the afterlife after the passing of my father, I’ve been researching, testing and working with psychics and mediums since January 1999. I now train psychics and mediums how to improve their readings and increase their professional success, fulfillment and client satisfaction based on what I've learned through this vast analysis and experience. Even if you are already familiar with my work, what you might not know is that, in the past decade, I’ve become a leading authority on the subject of psychics, mediums and the afterlife with TV, movie and documentary producers, journalists, book publishers, event promoters, as well as law enforcement agencies and private investigators. I’ve also been responsible for helping numerous psychics and mediums get on national television shows, obtain book publishing contracts, get booked by major event promoters around the world, and get interviewed by journalists and talk-show hosts in every media venue—TV, radio, print, Internet and documentary. Consequently, I share the very best of all my experiences and expertise with you in this workshop. Included in this audio program are the two subjects I taught during a weekend workshop in Kennebunkport, Maine. During this weekend, I taught A) THE CRITICAL CRITERIA FOR GIVING EXTRAORDINARY READINGS and B) BUSINESS & MARKETING STRATEGIES FOR PSYCHICS & MEDIUMS, both which I taught to more than 120 psychics and mediums. These two workshops, each lasting 3 hours in length (a total of just under 6 hours), were recorded so that I could share this material with other psychics and mediums like you for home study. My material lent itself perfectly for an audio program because I taught it as a lecture. There is so much valuable information here that the psychics and mediums who attended wrote frantically in their notebooks for the entire six hours, which is just another reason why I wanted to make these audio recordings available—it is the type of program that you'll want to listen to over and over, and each time you'll keep gaining new beneficial ideas. I also give you a workbook in PDF that you can use to follow along so that you won't have to write frantically like they did. Instead, you can print the workbook pages out and follow along as you listen while filling in the blanks that I inserted to maximize your memory and comprehension. Just so there's no confusion, both workshops from that weekend are included in this audio program. The two lectures presented in this audio program include every tip, secret, analysis, anecdote and advice that I gave the psychic mediums that weekend—many career-changing suggestions that I had never shared with any other psychic mediums before. I am so very excited about offering this training to everyone who was not fortunate enough to attend the live workshop. I had many people around the country who were upset that they had prior engagements and were going to have to miss out. But now you and those people will be able to attend without having to travel or even leave your home or office. While listening, you’ll be able to hear what a wonderful group of psychics and mediums we had in attendance. Everyone was so cheerful, playful and ready to learn. What’s especially nice about sharing this with you is that you get to feel like you were right there by hearing both me and the audience, listening to the exchanges and the laughter, and even hearing questions from the psychic mediums followed by my answers. Nothing is left out. You’ll even hear when a chipmunk entered the room to say hello for a brief moment. My wife, Melissa, had to coax him back outside. “I'll be putting your ‘Psychic-Medium Best Practices’ into my work from now on. I learned so much from you last weekend, I'd hire you as my consultant because I know I'd benefit so much from it! I found your class to be structured, well organized and jam packed with highly useful information that will help me solidify my business methods. I love your approach, it's practical, down to earth, business sense, that obviously comes from a strong knowledge base of research and investigation that has made you an expert. I'm so glad to hear from your experience with so many readings and psychics, it gave me a great perspective on what the best psychics do versus what not to do. In this workshop of just under 3 hours, I teach you what you need to do to transform your readings from poor, mediocre or even good to absolutely extraordinary. And, as I said, it’s a lot easier than you might expect. In my research of psychic mediums since 1999, I’ve tested hundreds of psychic mediums from around the world. What I recognized from this research and testing is that many psychic mediums with exceptional natural ability gave me poor readings simply due to the inadequate structure and delivery of their readings. At the same time, I also discovered the opposite, which is that some psychic mediums with average natural ability gave me fantastic readings simply because the structure and delivery of their readings was excellent. After hundreds of test readings over the years, I analyzed the best readings in comparison to the worst readings and discovered the critical criteria that made the best readings extraordinary. I compiled this data for eleven years and then spent an entire month of eight to ten hour days organizing it for simplicity and comprehension in order to teach it at this workshop. The result is what is contained in this audio program. What it takes to pass my famous (yet never revealed) 15-Point Test. What mistakes weaken and undermine even your best readings so they become less than extraordinary. What is necessary to include (and avoid) in your readings for the sake of ethics, professionalism, integrity and responsibility. How to make a good reading absolutely extraordinary so that you’ll stand out from the crowd of psychic mediums in front of clients, the media and live audiences. This part of the workshop alone is worth one hundred times the cost of this audio program. I originally included it because so many psychics and mediums need help in this area. In fact, any Mind/Body/Spirit practitioner could benefit a great deal from listening to this program. Even though many psychics and mediums from all over the United States and Canada spent more than $1500 to attend this live weekend workshop (with travel costs), several told me that they earned their investment back in two or three weeks due to what they learned from this program alone. Several actually doubled the number of clients they normally get on a weekly basis within two or three weeks after the workshop. c) Increase your client satisfaction (which will increase your referrals and repeat business). Many psychics and mediums also said that they've been getting a better quality of client since applying what they learned in these workshops, which makes perfect sense to me. 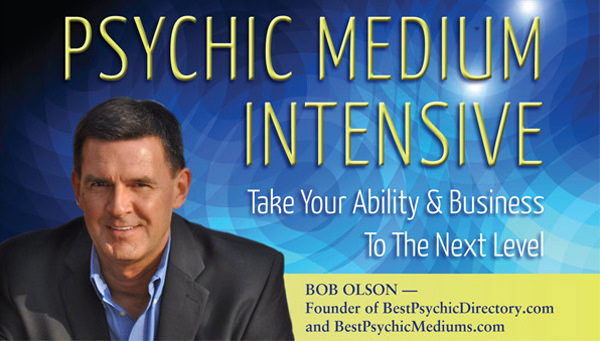 You’ll quickly discover that just one new and innovative idea can catapult your practice as a psychic or medium to a whole new level. Yet I give you dozens of new and innovative ideas in this workshop. How to increase your income while also maximizing your personal fulfillment and client satisfaction. The absolute must-know marketing basics, the big picture of business growth. What you need to know about getting published, obtaining media interviews & working with radio & TV producers. Internet & website know-how specifically for psychic mediums that can boost your exposure & response overnight. Many psychic mediums have told me that this program would be a bargain at $395, because that's what the workshop cost. But it’s important to me that as many psychic mediums as possible have the opportunity to purchase this workshop. I truly believe that this information can help to improve the entire psychic medium industry by helping each psychic medium, one at a time. So the cost of this program is only $197, which is much less than the cost of the live workshop, especially considering the cost of travel, hotel and rental car that many of the 120 psychic mediums had to spend. For most psychic mediums who charge at least $99 for a reading, you'll quickly earn the cost of this audio program back in your first new client (and you'll be getting a lot more new clients after you begin implementing what you learn in this audio program). Plus, unlike the live workshop attendees, you get to listen to the workshop in the comfort of your home or car, or anywhere you can take your MP3 player, with the added benefit of listening to it over and over. This program is available as an INSTANT DOWNLOAD. It is not sold in any other format, since you can also use the MP3s to burn your own CDs right on your computer (or have someone who knows how to do it burn them for you). This means that after you pay for the audio workshop, you will automatically be brought to a download page where you will download 7 files (3 audio files for the Critical Criteria workshop, 3 audio files for the Business & Marketing workshop, and 1 written file for the workbook). Full instructions will be provided on how to download them right there on the download page (and will be emailed to you). It’s super easy to do. The six audio files are MP3s, which you can listen to on your computer, MP3 player (iPod, iShuffle or iPhone, for example), or you can burn them onto a CD or DVD. The one written file is a PDF, which you can open on your computer and print on your printer. It’s worth repeating that all the step-by-step download instructions are right there on the download page PLUS they will automatically be emailed to you after your purchase with a link to the download page in case you accidentally close it. And if you ever have any issues downloading your product, you can always email my reliable assistant, Jen, at jen@bobolson.com. If Jen is not available to answer your email right away, don’t worry, as someone in my office attends to email every day. “I could go on for five pages about all the wonderful things I learned during your weekend workshop in Kennebunkport Maine. I came to the weekend as Dr. Cathy Ripley Greene, CHIROPRACTIC PHYSICIAN who happened to be a psychic medium. Somewhere in the middle of the weekend I realized I am Dr. Cathy Ripley Greene, PSYCHIC MEDIUM and a chiropractic physician. Thank you so much for this workshop. It really has opened my eyes. Many of us don't have guidance or don't where or how to "check in". This empowering audio seminar is worth every penny (at least to me) and I would recommend it to anyone who wants more structure and method to their readings. I've garnished a lot of knowledge in the years since our conversation and your instruction has been the icing on the cake. I am looking forward to attending your future lectures in person." YOUR CREDIT CARD OR PAYPAL STATEMENT WILL LIST THE SELLER AS "OLSON MEDIA GROUP." EMAIL MY ASSISTANT (JENNIFER) AT JEN@BOBOLSON.COM IF YOU HAVE ANY QUESTIONS.